Slide Table | Products Lineup | Products | NIPPON BEARING CO., LTD. The NB SLIDE TABLE is a precision table equipped with a SLIDE WAY. Its high-precision and low-friction characteristics make it well suited for use in electronics automatic-assembly machines, optical measurement devices, etc. The NB SLIDE TABLE consists of a SLIDE WAY sandwiched between an accurately machined table and a bed. Stoppers are provided inside the table. The mounting surfaces of the table and bed are precision finished to ensure high precision linear motion, resulting in a high performance SLIDE WAY. Its non-recirculating mechanism provides stable motion at from low to high speeds. Being designed compactly, the NB SLIDE TABLE holds the high load capacity and high rigidity characteristics. The table is carefully assembled so that the accuracy and preload are optimized, it can be used immediately without any further adjustment. Standardized mounting holes are provided in the table and bed. 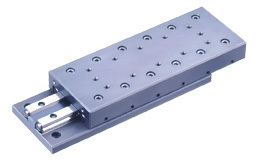 High precision linear motion can be achieved simply by mounting. The NVT type SLIDE TABLE incorporates the NV type SLIDE WAY. The table and bed have been precision machined to provide a high degree of accuracy and the product can be used, without any need for troublesome accuracy or preload adjustments. In the SVT type SLIDE TABLE, the SV type SLIDE WAY is sandwiched between an accurately machined steel table and bed. In the SVTS type, the anti-corrosion SVS type SLIDE WAY is sandwiched between an accurately machined aluminum table and bed. The SYT/SYTS type is a thin, compact SLIDE TABLE. Either tapped or counterbore type (D type) is available for the mounting hole. The anti-corrosion SYTS type SLIDE TABLE is made of all stainless steel components, making it suitable for use in clean rooms.